I'm trying to figure out how to get a section to show my maximums for a few different time periods. I am not just wanting these for one exercise, but basicly to show my highs to date. I am wanting it to show the following, but not in graph, I would like them in a table. Max, 5s, 10s, 20s, 30s, 1m, 2m, 5m, 10m, 20m, 30m, 60m. 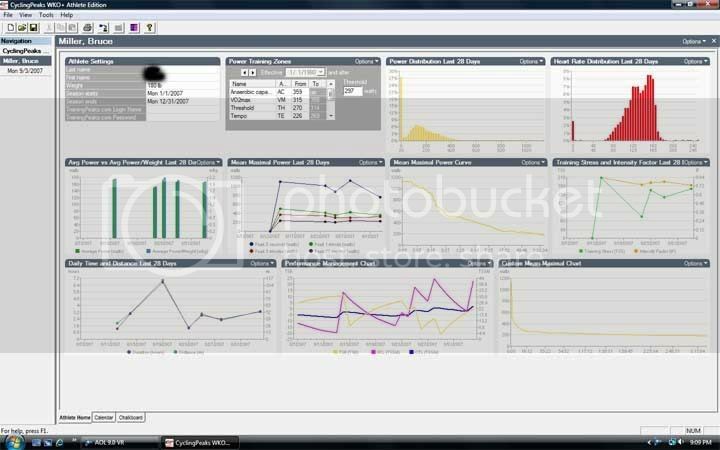 I liked having this data when I was using TrainingPeaks.com. It let me see if / how I was improving in different areas. This is how it was using TrainingPeaks. Can anyone tell me how to set up something like this? Using a Custom Periodic chart set to the time period you are interested in (i.e., the entire season, past 28 days, past 7 days, custom range), you can set it up to show bars (there's no table option). When you point at the bar it can give you the max value that occurred during the time range you selected for the Mean Maximal Power associated with 5s, 10s, 1m, 5m, 20m, and 60m. You have to set 'Days per point' to 28 days if you are interested in the last 28 days or 356 for the entire year if that is how you have your season set. You can probably get an external table once you've set up the chart by selecting the Options control in the top right corner of the new Custom Periodic chart followed by selcting 'Copy raw data'. Then paste the data into a spreadsheet. Last edited by NoRacer; 09-03-07 at 08:15 PM. The graph at the bottom right of your screenshot has what you're looking for. Go to properties and change the X-scale to Logarithmic and it should be more helpful. Then you just mouse over any part of the curve and it will tell you the wattage and date. Thanks. That got me pretty close. Only thing I don't get out of this one is what date the maximum occured. It gets me in the ball park though. Thanks. I was looking for more of a "quick glance" type thing so I could see if my more recent rides are higher than previous rides. What can I say, I'm lazy. Thus you can compare your bests at all time ranges from this season to last season, for example. Thanks, that is pretty cool as well. I have one more question. 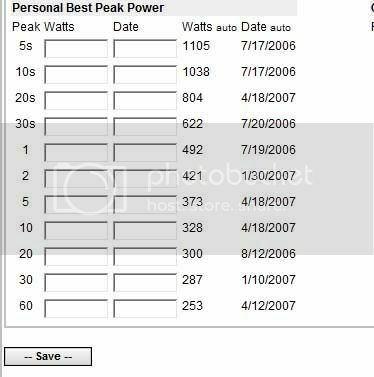 When I purchased cycling peaks it said it could only be used with one computer. That is fine even though I would like to be able to use it with my lap top as well as my desk top. I can live with it. My question is, what happens when I buy a new computer or my computer crashes? Do I have to purchase the program again? Check to see if there is a deactivation feature. I don't use CyclingPeaks (yet), but Adobe's applications all have a deactivation feature. You can install them all over the place, then just deactivate one and re-activate on another machine with the CD key. On cyclingpeaks home page, click on unlock software. Enter your user name and password (you should have a confirmation email that has them in it), click submit and a screen comes up with your license identifier and your payment id that I assume you could use to unlock again if you computer crashed and you had to reinstall the software. A 2nd license of cyclingpeaks is $48.50 if you want to use it on your laptop. It would be nice if they had a two computer limit for the $99 initial price. Thanks, but what I am curious about is if my computer crashes and I have to reinstall the program on it. Will I still have to pay again or is there a way to do it for free? Using a microsoft program crashing is always a possibility. From cyclingpeaks forums and Hunter Allen - they will get you set up again with new codes you don't have to pay again. "Give support@cyclingpeakssoftware.com a shout when you machine goes kaput. We'll help you out and you won't have to buy a new license. Great, that was what I was looking for. I looked on the website a bit but wasn't able to come up with an e-mail to ask them. Thanks! I emailed the address given in the previous message and only got a form mail saying "we have discontinued support for versions of the software previous to WKO+ v2.1". I understand that they can't support old software with bug fixes or customized support answers, but I'm annoyed that they can't provide a simple way to make the software work after a computer replacement. I was probably going to upgrade soon, but this brings out my stubborn streak. Maybe I'll see if I can hack my old version into working condition.